Brush- turkeys or Bush Turkeys (Alectura lathami) as they are sometimes called, belong to the megapodes family, meaning that they are incubator birds or mound-builders, and build large nests in which to incubate their eggs; the heat generated, like in compost bins, from these mounds of leaves is what incubates the eggs. The males build the nests. Their name megapode literally means "large foot" (Greek: mega = large, poda = foot), and is a reference to the heavy legs and feet typical of these terrestrial birds. Several females will lay their eggs in the one mound (up to 30 eggs can be there although the average is 18-24) and the chicks are unusual among birds as they will hatch fully feathered and be able to fly within a few hours – a good thing as these birds are ground dwellers or not predisposed to flying for long times, although they can. They are able to run fast and jump over fences quite easily. Lyre birds are also ground dwellers. A young Brush-turkey that was scratching around in our backyard last year at this time. Megapodes are medium-sized to large terrestrial birds with large legs and feet with sharp claws. They range from 28 to 70 cm. The largest members of the clade are the species of Alectura and Talegalla. The smallest are the Micronesian Scrubfowl (Megapodius laperouse) and the Moluccan Scrubfowl (Eulipoa wallacei). They have small heads, short beaks, and rounded and large wings. Megapodes are found in the broader Australasian region, including islands in the western Pacific, Australia, New Guinea, and the islands of Indonesia east of the Wallace Line, but also the Andaman and Nicobar Islands in the Bay of Bengal. The distribution of the family has contracted in the Pacific with the arrival of humans, and a number of island groups such as Fiji, Tonga, and New Caledonia have lost many or all of their species. 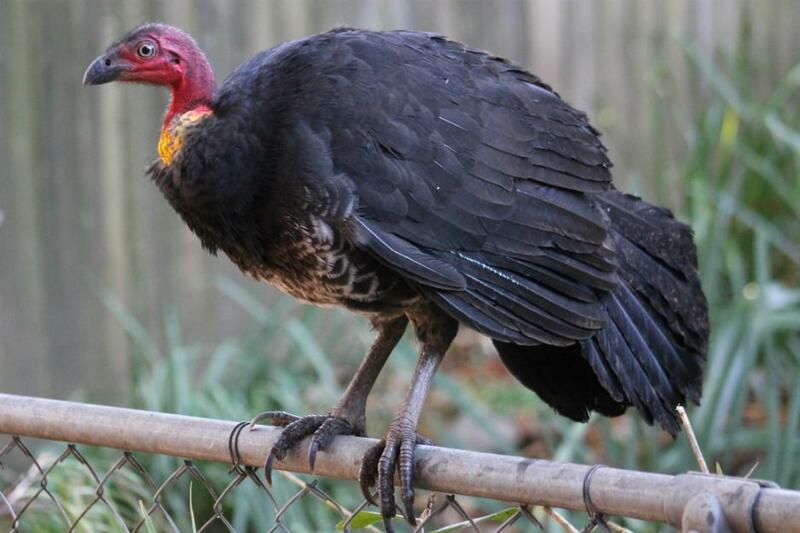 Brush-turkeys or Bush turkeys are the largest of Australia's three megapodes. the other two found here are the smaller (45 cm) Orange-footed Scrubfowl, Megapodius freycinet, which shares part of the Australian Brush-turkey's northern range, is entirely dark grey to brown, with the exception of bright orange legs and feet and the Malleefowl, Leipoa ocellata, a largely brown bird, barred with black, white and rufous. It is found in southern and south-western Australia. They are part of the family of fowl-like bird (chickens-Order Galliformes), and this includes quails, turkeys, peafowl and junglefowl. They are called ‘wee-lah’ by the Indigenous peoples of the Hunter Region and many of our original custodians used to eat the easily gathered eggs. These birds will themselves feed on insects, seeds and fallen fruits exposed by raking the leaf litter or breaking open rotten logs with their large feet. Brush Turkey in our backyard Friday afternoon again (11.10.2013) - perhaps the same fully grown bid as above. Brush-turkey colonies are common in the urban environment and we have seen one group of three strolling beside Careel Creek last year although they are meant to be fairly solitary birds. Mostly they live in rainforests and wet schlerophyll forests, but can also be found in drier scrubs. 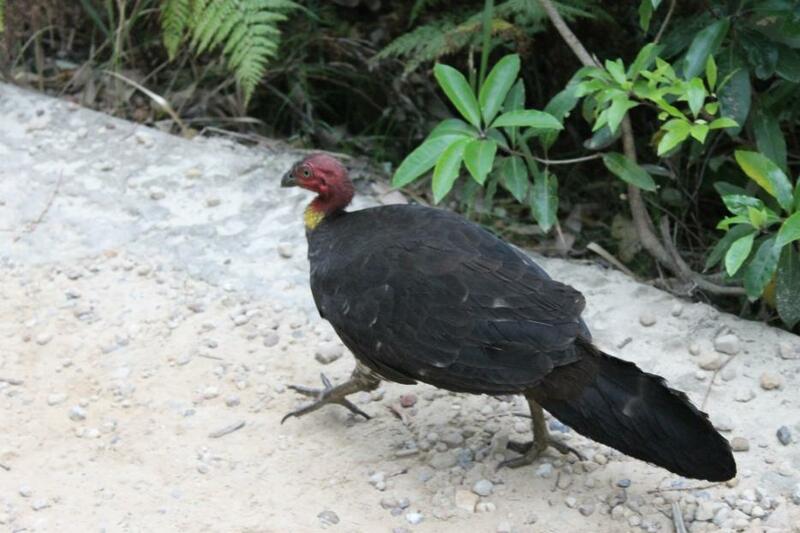 In the northern part of its range, the Australian Brush-turkey is most common at higher altitudes, and will move to the lowland areas in winter months. In the south they are common in both mountain and lowland regions. Brush turkeys are protected by law and as with all our birds which may become tame through feeding them, it is also illegal to feed our native birds. Creating areas where they can visit your garden by introducing native plants or replacing those that are not with bird attracting foliage that will shed seeds I season, or in the case of the Brush-turkey, creating a mud of compost in a shady corner they may then make their nest, will let you see these magnificent creatures stroll through your mornings and afternoons. Unless it is a nest guarded by a dad Brush-turkey, they can be quite shy so if you want to watch them, just be a little bit kind and stand quietly so you don’t make them anxious with noise or sudden movements. Brush-turkey (Alectura lathami) at Barrenjoey last Spring. Photos by A J Guesdon 2012 - 2013.